Like cities along the Volga, it's difficult to travel between places in Uzbekistan because train and bus service is almost non-existent. This means negotiating for a taxi. We want to see the next big stop on the Silk Road, Bukhara, so we ask local people where the taxis hangout, a place where price fluctuates more wildly than the futures market. The Uzbeks try to gauge how much money is acceptable to foreigners while we try to gauge the Uzbek price range. If you made a bad deal you may find your fare being sold off, like a bank's mortgage loan, to another taxi driver, often in mid-trip. We were passed to a new cab at Navoi where we shared the ride with a rambunctious Russian couple. They insisted that we stop at a roadside café for a snack and a fifth of vodka. 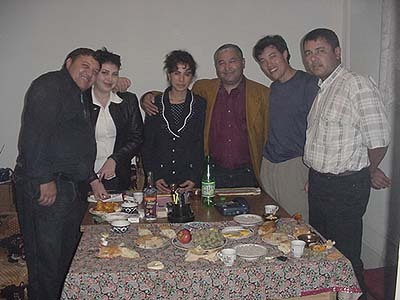 After we finished off the bottle (the driver didn't drink) we visited their friends in Bukhara where we drank another bottle. Thoroughly drunk by now they dropped us off at a another friend's home where we spent the night. The Bibi-Khanym mosque, Timur's intended masterpiece of grand dimension. Too grand, it seems, because it fell apart a few years after completion. Bibi-Khanym was Timur's Chinese wife, she's buried across the road. 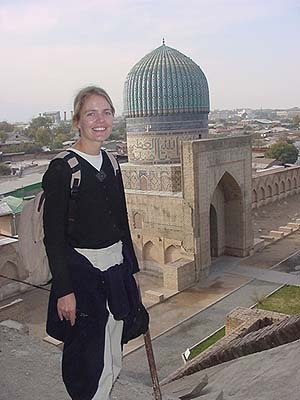 She takes centerstage in a story about this building that says she ordered it built as a present for Timur; the architect fell in love with her; Timur found out, killed the architect, and decreed that women should wear veils to keep from tempting men. 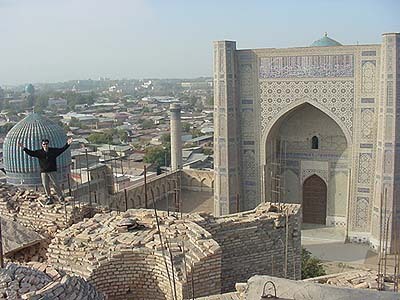 Blah-blah, tip the guide a few Uzbek sum and take in the view. It's an impressive shell of a building. The trademark of Timurid architecture is a ribbed, azure blue dome made from earthenware tiles baked with an enamel finish called majolica. Get in a cab and you risk being taken to a party rather than your destination.